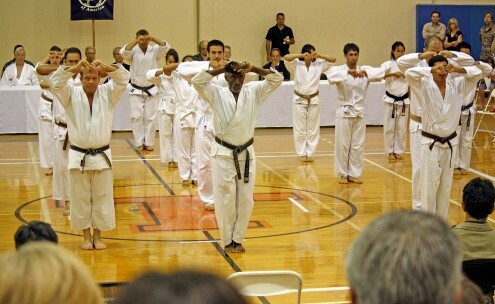 Karate practice benefits the student in all areas of their life. It is not an end, but a means to an end. Karate encourages proficiency and the keen coordination of mind and body. It is an activity in which advancing age is not a hindrance. The word karate is a combination of two Japanese characters: kara 空, meaning empty, and te 手, meaning hand; thus, karate 空手 means “empty hand.” Adding the suffix “-do” 道 (pronounced “doe”), meaning “way,” i.e., karate-do 空手道, implies karate as a total way of life that goes well beyond the self-defense applications. In traditional karate-do, we always keep in mind that the true opponent is oneself. Shotokan founder Gichin Funakoshi said that “mind and technique are to become one in true karate.” We strive to make our physical techniques pure expressions of our mind’s intention, and to improve our mind’s focus by understanding the essence of the physical techniques. By polishing our karate practice we are polishing our own spirit or our own mentality. For example, eliminating weak and indecisive movements in our karate helps to eliminate weakness and indecision in our minds—and vice versa. One of the unique features of SKA karate training is what we call Special Training—a series of intensive practices during which we try our best to “face ourselves” and polish our mentality or spirit.